The Susquehanna Valley Taxi Cab Inc., owned and operated by Susquehanna Valley Limousine Inc., will be operational by Jan. 1 at the latest. Co-owner Chris Peifer, pictured here, said the transportation service is needed in the area. 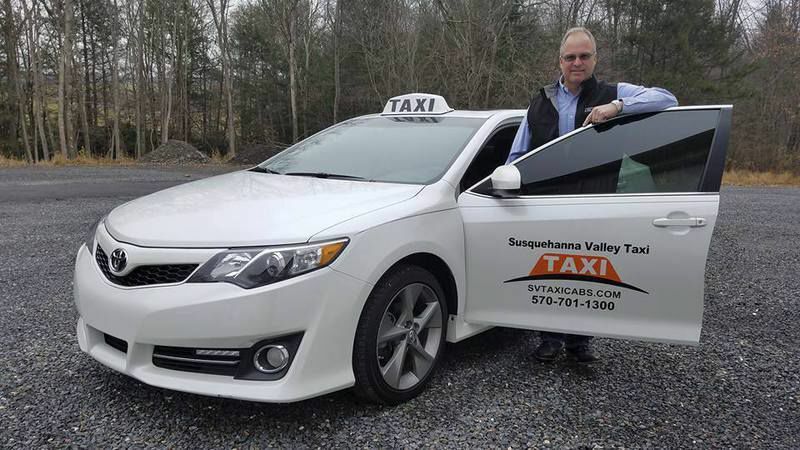 A 2013 Toyota Camry is one of two vehicles that will be used to launch the Susquehanna Valley Taxi Cab Inc., owned and operated by Susquehanna Valley Limousine Inc. The owners of Susquehanna Valley Limousine will be hitting the gas within the next six weeks on a taxi service for Northumberland, Snyder and Union counties. Chris Peifer, who with Matt Markunas has owned the pre-arranged transportation service since 2005, said the Susquehanna Valley Taxi Cab Inc. is a service that is needed in the area. Peifer said his company has been fielding calls for years from people who want to be picked up for dinner or get rides to different places, but the limousine service is pre-arranged, not on-demand like taxi cabs, according to the Public Utility Commission (PUC). Susquehanna Valley Limousine is one more entity attempting to fill the transportation need in the Valley. In August, Uber was allowed to expand into Snyder County, but not Northumberland, Union and Montour counties due to licensing issues. On Nov. 4, Gov. Tom Wolf signed a bill into law making ride-sharing legal across the entire commonwealth. The area also has Paul’s Cab Service in Sunbury, K-Cab in Bloomsburg and Shamokin Yellow Cab in Shamokin. By Jan. 1 at the latest, Susquehanna Valley Limousine will roll out service with two white 2013 Toyota Camrys with meters, credit card payment machines and eventually a cell phone app. The four-door vehicles with black and orange lettering will have the capacity for four passengers. “Customers want a reputable service that will work for them,” Peifer said. Don Alexander, the Northumberland County’s planning and economic development director, said the creation of a taxi service is good news for the area. Peifer promises a consistent service with drivers who are vetted and trained, with technology that is up to date and a way to get from Point A to Point B.
Susquehanna Valley Limousine has been in existence for nearly two decades. The company has a fleet of 20 vehicles, ranging from town cars to 35-passenger buses. In accordance with the PUC, the limousine business and the taxi business must be separate entities, but they both can be operated from the same location. Insurance issues and protests from other transportation services to the PUC caused the taxi service idea to take nearly two years to complete. The goal is to add more taxi cabs and expand into other counties, Peifer said. Hours are not yet set, but the service is expected to be available nights and weekends, he said. “The ultimate goal is to be at the right place at the right time,” he said. The company will be studying patterns and demand times in order to accomplish that goal, he said.